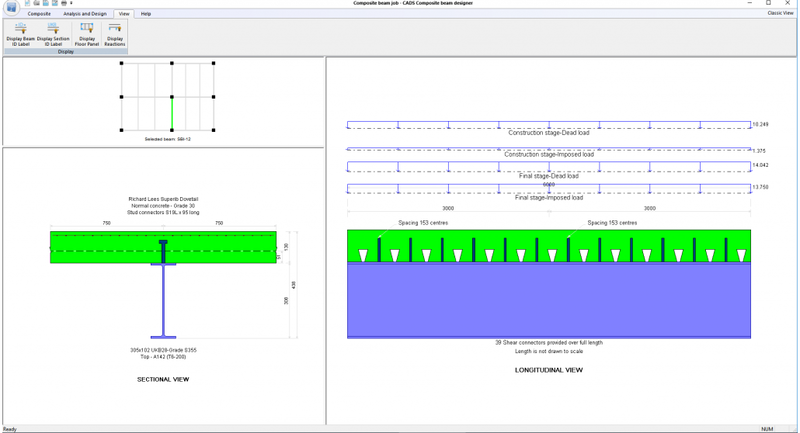 Composite Beam Designer is a program for use in the structural design or checking of Composite Beams. CADS Composite Beam Designer prepares calculations for strength, stability and stiffness. 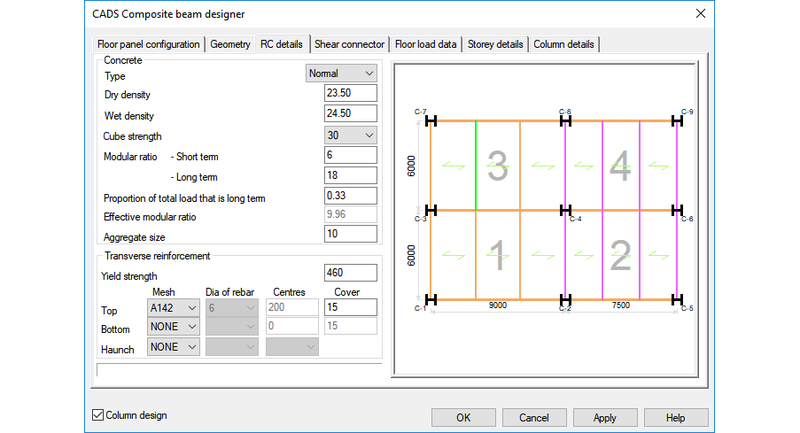 Input of column properties, end conditions (fixed, partial, nominal or free) and clear column height automatically produce the effective height and slenderness ratio. Concrete and reinforcement proper ties, such as concrete strength, aggregate size/weight, maximum, minimum and preferred diameters for hot rolled mild or high tensile main bars and links can also be entered. A cover calculator automatically assesses cover required according to fire and durability parameters. 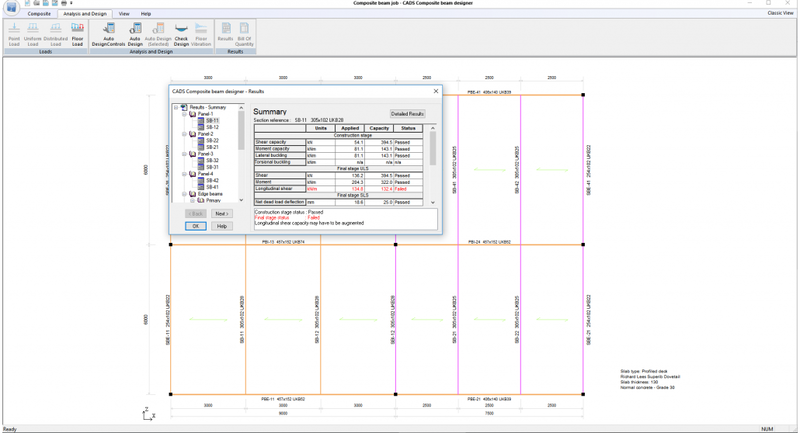 Check mode – where the steel section is specified by the user and the program checks the adequacy of the section for the given materials and load. Auto-design mode – where the program automatically selects the passed section(s) type of sections (including UB, UC RSJ, IPE, IPN etc. ), according to the users´ preference for minimum depth or width. 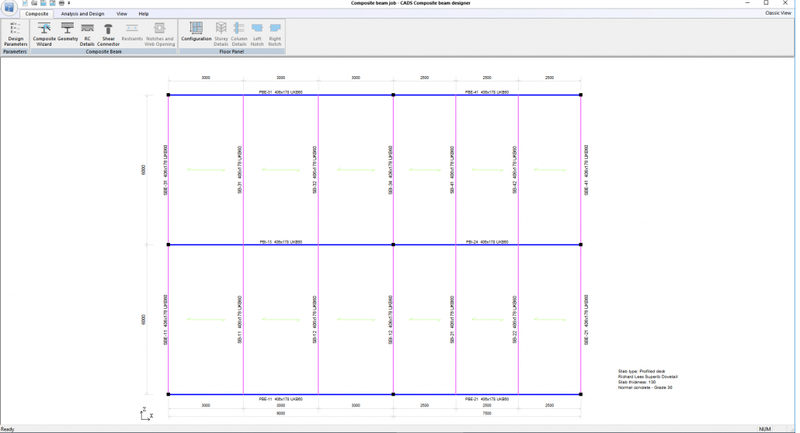 CADS RC Column Designer is a popular stand-alone application that can also be purchased and used as part of the CADS Structural Engineering Suite. By using the dynamic Windows linking from CADS A3D MAX all of the data for the column design can be imported by dragging the column from CADS A3D MAX onto CADS Column Designer. Detailed AutoCAD drawings and bar bending schedules may be produced automatically by CADS RC from the design results. 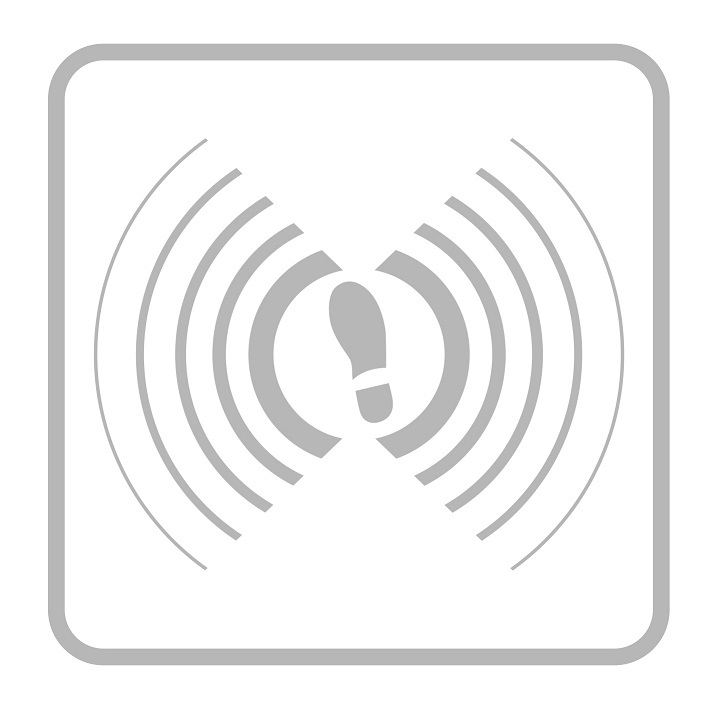 Users may control floor vibration by specifying acceptable deflection limits and the natural frequency limit of the beam. Pre-camber can also be accommodated. Props may be used at the construction stage to reduce deflections and prevent the capacity of the steel beam from being exceeded before the concrete gains sufficient strength. The software omits all construction stage checks for propped beams. Composite action between the steel beam and the concrete slab is developed by the use of appropriately designed and detailed shear connectors. 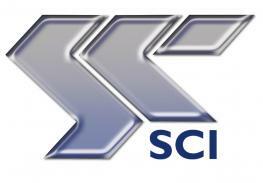 Shear connectors can be selected from a library of commercial products. Final stage composite beams are considered as continuously restrained. Point and distributed restraints applicable for the construction stage checks may be specified by the user at the top, bottom, both or centre of the beam. Rectangular or circular openings (including stiffeners), necessary to accommodate services, etc. may be defined in the webs of I-sections and hollow sections. End notches can also be specified. Uniform, point and distributed dead or imposed loads may be specified for construction and final stages. A tick box adds the self-weight of steel beam as a UDL. 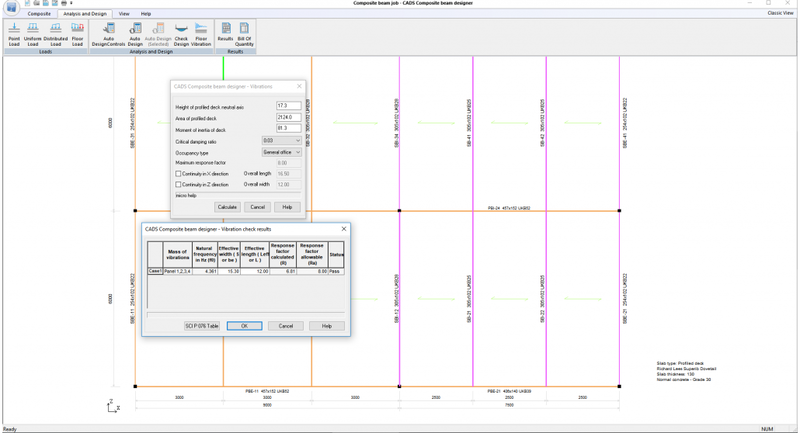 Beam loadings can also be given in terms of area loads by ticking the floor load option. Calculation results are displayed in a user friendly and self-explanatory explorer tree type layout and are offered in several layers of detail, from summary to in-depth calculation results. There are two printout options available, detailed and single page summary. Both can be previewed on-screen prior to printing and customised with the user´s company details and logo.